A cat makes itself at home at a local advertising firm. As pets become increasingly popular additions to local households, some companies are allowing employees to bring pets to the office. And the normally hard-headed world of business can become just as besotted as any individual citizen. This stray cat has been "an important member" of Shanghai 54Traveler Travel Service Co since she was rescued on the street early this year. "She is the boss of our company," said Zuo Huimin, co-founder of the company. She added the cat was near death when rescued and taken care of by several workers at the company who took it in turns to look after her. Soon Dao Xiaodao was coming to the office almost every day. "Our company has about 60 employees, and every time she appears, we queue to stroke her," said Zuo. "The cat likes staying with us, but she never bothers us when we work. We miss her if she doesn't come to the office, even if it's only a day." "A cat can enhance bonds with colleagues," added Zuo. Some workers also bring their pet dogs to the company when they have to work at weekends or during holiday periods. Doris Li, an HR officer at a local Internet company, told Shanghai Daily that her company had taken in three cats. It began when one of her colleagues picked up a stray near the office when he came off work late in the evening after working overtime. "Most of us fell in love with the adorable animal and agreed to keep it with us, including our chief executive," she said. "We even decorated one office room to be its home and bought toys for it. We also took it to the vet for vaccination." Li said the cat, named as Yugo, became its CEO — chief entertainment officer — and they created a Facebook account about it, updating the social network page with latest pictures of the cat. The company even produces small gifts based on Yugo's image for clients. Employees liked Yugo so much that they picked up another two — Yo and Bibi — after Yugo fled from the office one day. "The cats made us feel relaxed during intensive work," Li said. "When we are tired, we all like to play with them." "They do not bother us much," she added. "Sometimes, they would occupy our chairs or walk into the meeting rooms when we were having meetings, but these are not big problems." But not all office workers are so entranced. 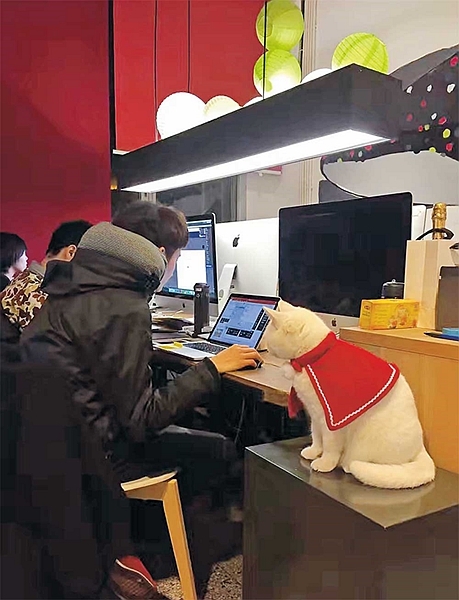 "I don't think allowing pets into office is a good idea because there are people allergic or pregnant, and it is more reasonable if companies allow workers to bring their children to office," said Anna Wang, a media worker. She said she is afraid of the unexpected animal visitors. Shirley Sha, an office worker, also said she was afraid of them, in fact she doesn't like any fluffy animals. If her employers allow pets in the office, she said she will resign. Even employees who like pets express concern over having them at their work. "If there is a dog working with me, I will spend half a day fondling him," said Stone Shi, a cruise ship company employee. "I cannot focus on work. And what if the cats and dogs injure people?" Li said none of her colleagues had strongly opposed the existence of cats at her workplace and those disliking animals simply kept away from them and sometimes asked colleagues to help remove the cats from their seats. "Even some colleagues who had been accidentally injured by the cats have never asked us to drive them away," Li said. "They just went to the hospital for vaccination and paid the fees by themselves." "Most of our employees are from generations born in the 1980s and 1990s, who love pets," she said. "And when the majority of us love the cats, the minority would not show fierce counter views." She believes cats can live with people in peace if an office makes the proper arrangements. Li said some pregnant colleagues and some who were planning to have babies had expressed worries about parasites or bacteria carried by cats. She said her office has two floors. The cats are restricted to one of them and people who don't want to be with them work on the other floor. "There will always be solutions if you really want to keep the pets."